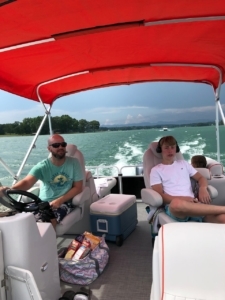 Pontoon Boat Rentals on Lake Keowee! 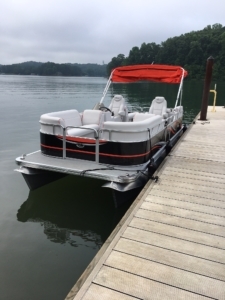 Hartwell-Keowee Paddleboard & Kayak Co. is proud to begin offering Luxury Pontoon Boat Rentals on Lake Keowee. Our boats are brand new with Yamaha 115 HP motors featuring many upgrades such as an onboard GPS system. Day rentals, multiple day rentals, weekly and multiple week rentals are available. We will provide life jackets and all safety equipment needed for a fun day on the lake. Hartwell-Keowee Paddleboard & Kayak Co. requires each person who rents a Pontoon Boat watch the below boating safety video. South Cove County Park is located on the clear, blue waters of Lake Keowee. Simply walk into the office to check in, then we’ll head to one of the boat ramps to begin the rental. 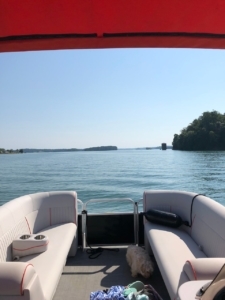 Hartwell-Keowee Paddleboard & Kayak Co. will provide instructions on how to operate the pontoon boat safely and we will answer any questions you may have. 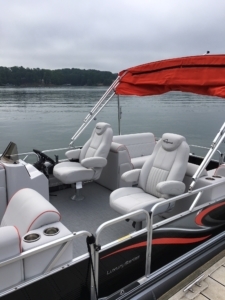 We will provide a waterproof map of Lake Keowee as well as Life Jackets and a fire extinguisher. South Cove County Park is located at 1099 South Cove road in Seneca SC. Where do we meet to pickup the boat? South Cove County Park in Seneca, SC. The address is: 1099 South Cove Road, Seneca, SC. Will you deliver/pickup the boat from our Lake House on Lake Keowee? Yes. We will deliver the boat to your dock and pick it up after the rental for $200. How old do I have to be to rent a boat? You must be 25 years old to rent a boat from Hartwell-Keowee Paddleboard & Kayak Co.
Do you require a security deposit? Yes. We require a $500 deposit. After the rental is over and the boat is returned with no damage, the $500 security deposit will be returned less the cost of gas used. We will provide a full tank of gas when renting the boat. When the boat is returned, we will refill the tank and subtract the cost of gas from the security deposit. If the boat is returned with a full tank of gas, with no damage, the entire $500 security deposit will be returned. What is the cancellation policy? You can cancel at least 48 hours in advance for a full refund. Cancellations less than 48 hours in advance are subject a charge equal to the deposit. If you cancel within 48 hours we will try to rent the boat. If we can, your security deposit will be returned. Are life vests included? Yes we will provide all safety equipment. When do rentals begin and end? Full Day Rentals will begin at 9:00am and end at 5:00pm. If you need to adjust this time, please let us know. If we know ahead of time, most of the time we can accommodate the time changes. When do weekly rentals begin and end? Weekly Rentals will begin at 9:00am on Day 1, and will end at 5:00pm on Day 7. For example: A weekly rental starting Saturday at 9:00am will end Friday at 5:00pm. When do I need to be there for my rental? Please arrive 30 minutes early so we can fill out the paperwork and go over any training needed. What else do I need to bring? We always recommend you bring at least one fully charged cell phone in case of emergencies. Your Driver’s License, Snacks, drinks, ice and sunscreen. We can provide a cooler and ice for an additional $20 per day. Can I bring alcohol on the boat? Yes. There is no open container law on a boat. The driver can not be impaired. The penalties for a DUI on a boat are just as tough, if not tougher, than a DUI in a car. How much do I have to pay to make a reservation? For a daily rental we require 50% to reserve the boat. The remaining balance plus the $500 security deposit will be paid at the time of the rental. For rentals longer than 1 day, we require $500 to reserve the boat. The remaining balance plus the $500 security deposit will be paid at the time of the rental. What if you cancel my rental because of bad weather? If we determine that the weather is bad and we have to cancel the rental, we will refund 100% or credit you for a future rental. Copyright 2015 Hartwell-Keowee Paddleboard & Kayak Co.